With the reformatting of the divisional format in the NHL, you might be left with questions about the team’s in Buffalo’s division, the Atlantic Division. Who will the Sabres be seeing a lot of? Where will they shake out? Thankfully for you, that’s where I come in. Welcome to your guide to the division. What did they do last year? All in all, the season ended up going fairly well for the Senators. Which is to say that the Senators still managed to make the playoffs despite being the real life version of AMC’s The Walking Dead. The NHL regular season schedule was released on Friday. Check out our partners at TiqIQ for the best deals on Buffalo Sabres tickets for all 2013-14 games.Jason Spezza herniated a disc in his back and needed surgery, Milan Michalek had arthroscopic knee surgery, Craig Anderson – he of ridiculous stats early in the season – dealt with ankle injuries much of the second half of the season, Jared Cowen had hip surgery, and star defenseman Erik Karlsson missed most of the regular season when his Achilles tendon was cut by Pittsburgh’s Matt Cooke in a fluke (to everyone but Senators owner Eugene Melnyk, who is still trying to launch his own CSI-style investigation into the incident) accident. While that kind of attrition would decimate most teams, the Sens continued to find ways to win games, earning themselves the nickname “Pesky Sens”. Karlsson, doing his best Wolverine impression, came back before the end of the regular season (even though he was supposed to be done for the season and playoffs) looking just as dangerous as ever. The team would finish seventh in the East, clearly better than their standing when at 100%. In the playoffs, they got second-seed Montreal in the first round and proceeded to take it to the bleu, blanc, et rouge. They chased Montreal goaltender Carey Price, who couldn’t finish the series due to injury, and dominated the series en route to a 4-1 series victory and a date with the top-seeded Penguins. Unfortunately for the Sens, being pesky wasn’t enough. Even with Spezza returning for game three of the series, the Penguins clearly were the superior team and dispatched the surprising Sens in five games, ending their season. What do they look like for this year? 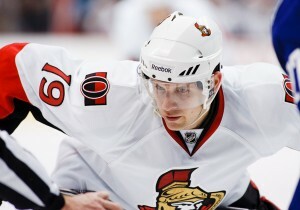 The Sens will look a little different this year but not necessarily worse. The biggest change is the fact that for the first time in many, many years, someone other than Daniel Alfredsson will be wearing the captain’s “C”. Why? Well, that’s because Alfie has left Canada’s capitol for Motown. It’s still weird to type but that’s the way our current world is. Shortly after that, the Sens made a blockbuster deal with the Anaheim Ducks to acquire star winger Bobby Ryan. Spezza, Cowen, and Michalek all return healthy, and the team will see deadline addition Cory Conacher for a full year. In other words: this could be a dangerous team offensively with a ton of speed and skill to go around. Defensively, they have a ton of size with Cowen, Eric Gryba, Marc Methot, Chris Phillips, and Patrick Wiercioch (Methot and Phillips are the smallest at 6’3”) with Karlsson providing the best offensive game from a defenseman in the NHL today. To say that they’ll be balanced, fast, and dangerous is an understatement. In net, they’re deep. They had enough depth to get rid of the emerging Ben Bishop at the deadline (bringing back Conacher), with Anderson leading the way as starter. He was a man possessed last season, posting a 1.69GAA and .941 save percentage in his 24 starts and that was with a bad ankle hampering him late in the year. Behind him is Robin Lehner, who was almost as good – 5-3-4 with a 2.20 GAA and .936 save percentage. They’ll be deep and have a chance to win every night because of the talent of their starting duo. Where do the Sabres stand? The Sabres lost three of four to the Senators last season and consistently struggled. The Sabres, for all the size they don’t have, aren’t fast enough to keep up with a team like the Senators. Combined the tenacity the Sens exhibit on a nightly basis with their speed and that’s a hard thing to deal with. Cracking Anderson was just as tough but then again, that was an issue for the rest of the Eastern Conference last year. The Sabres will have to make sure to cause as much havoc as they can in front and pepper the net with shots. This concept was one the Sabres struggled with last year so hopefully the new staff can ingrain it in their heads that you have to shoot to score. Novel idea, I know.